Six years ago, the graduating class from Forest Lake Academy donated $7,000 to a small community in Binalbagan, Philippines. A small school and community center was built from these funds. In 2016 we went back and continued work on the facility. We hope to continue this connection with this non-Adventist community through relationship building, worship experiences, and VBS-like programs for the school children. Our next mission trip has yet to be announced. If you are interested in finding out more information please call our front office or send us an email. 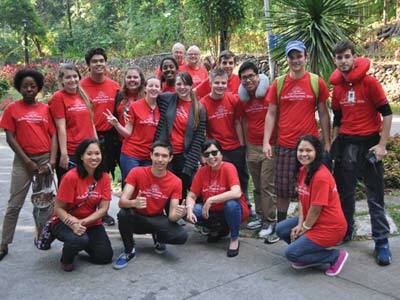 Below we answer some common questions about our mission trips and their cost. At the beginning of the trip we develop an estimate of potential expenses. These expenses include airfare and related transportation costs, team training and administration costs, board and lodging expenses, and ministry expenses. Every effort is made to minimize costs without jeopardizing the quality, effectiveness, or safety of the ministry. Personal expenses ARE NOT included in the cost. We encourage team members to raise funds primarily through their fund raising letters. Raising funds through these letters expands the group of family and friends who will be praying for you, and gives a wider group of people to participate in the ministry. Previous teams have found that fifty letters sent out in a timely basis will bring in the necessary funds. How critical are the deadlines? The deadlines are vital. Usually the deadline is determined based on a major payment for airlines, visas, housing accommodations, or vehicle rental deposits. Therefore, every effort must be made to make payments on time. If through unforeseen circumstances, this is not possible, let your team leader know as soon as possible. Are donations given for this trip tax deductible? Yes. For each person who gives support to you as long as the check is made out to Forest Lake Academy with the memo SonShine Philippines 2018. What is the proper way to explain to people how to give money to my ministry? What if more money comes in for me than I need? Throughout this ministry you will be functioning as a part of a team. Your effectiveness is determined not just from an individual standpoint, but also as a team. Therefore, the goal is to fund the entire trip, and any monies given beyond what is needed for the trip will be used to leave a monetary gift for our host.